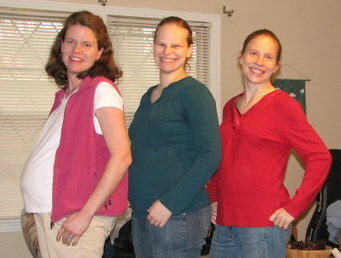 The point of this trip was to visit with some good friends – who both happen to be pregnant. So we would talk, share child training ideas and birth stories, get baby stuff ready, take breaks and maybe go for a walk. Of course, fellowship means eating too and Lance really got into this part of visiting! Eating his toes while waiting on a meal. And with babies being so prominent in our minds, the soon to be parents saw Lance as an opportunity to test their abilities. 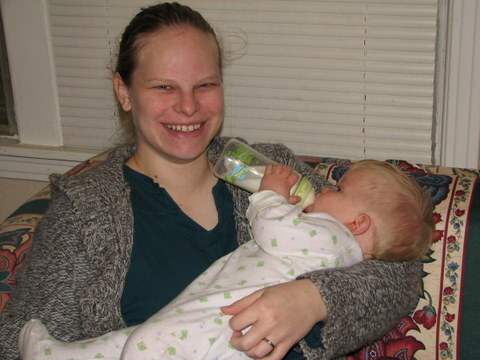 Bekah practices “mommy skills” as Lance eats his breakfast. 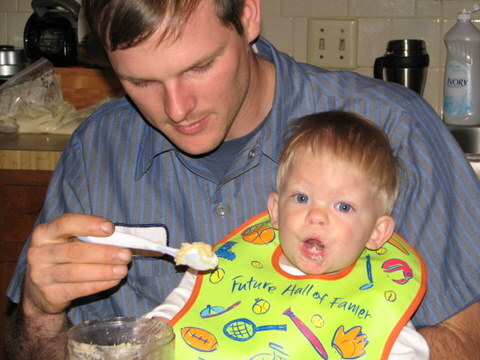 Jason practices “daddy skills” by feeding Lance some supper – chicken spaghetti, yum! We had a wonderful time of fellowship, laughter and heart-to-heart sharing. What a blessing to have such good friends!